There were smiles for the cameras, but they were not enough to avoid a clash between the British foreign secretary and his Russian counterpart in Moscow. 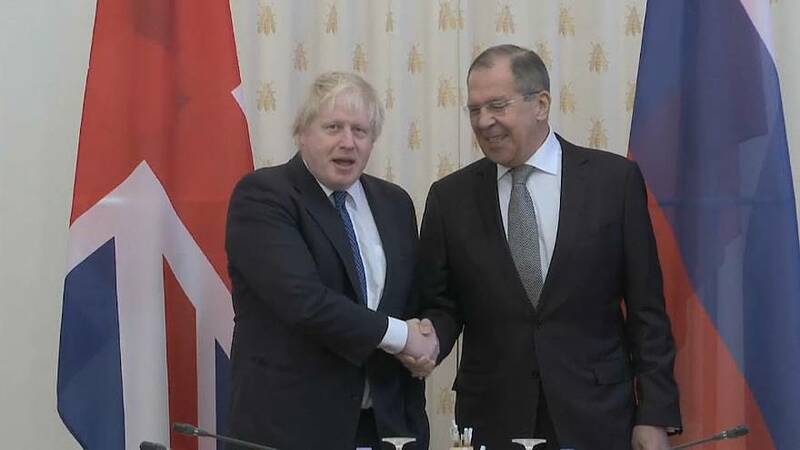 The first UK foreign minister to visit Russia in just over five years, Boris Johnson agreed that relations were going through what he called a "very difficult patch". He said: "We can't ignore those difficulties. We cannot pretend that they don't exist and we don't share a common perspective on events in Ukraine, or on the western Balkans, or as Prime Minister Theresa May has said on Russian activities in cyber space. "And we speak up for the LGBT community in Chechnya, and elsewhere, as people would expect from us." There was a tough denial from the Russian foreign minister, who also criticised Johnson for voicing concerns publicly. Sergei Lavrov said: "I don't recall any aggressive actions that Russia has made against the UK. "We've never accused London of anything and, on the contrary, we've heard a lot of accusations, even insults, made by the UK towards Russia: that we support a criminal regime in Syria, that we're aggressors, that we're occupiers." Despite the sparring between the two men, Lavrov said he trusted Johnson and the pair agreed to try to improve relations. The Russian foreign minister said: "It is not a secret that our relations are at a really low point, not due to our initiative. "We have seen that you and other Western colleagues have your views on why this situation exists and prefer to set out these reasons publicly. "We wanted to discuss our mutual concerns directly, not through a microphone, but eye to eye." On the question about the state of relations between the two countries, Johnson said: "(Our relations begun) ever since, I think, Elizabeth I sent an envoy to Ivan the Terrible, and as you rightly said Sergei, things are not easy between us at the moment." He added: "When I look at the difficulties in our relationship, whether it's over Ukraine, or over the Western Balkans, or what's going on in cyber space, I agree with you, it's important to talk about these things and to be frank about them, and to accept that they are obstructions in our relationship at the moment." "I know that in spite of the difficulties that we have between us as you rightly say Sergei there are signs of economic progress," said Johnson. There was also an attempt to add humour to the exchange. Johnson said: "I am delighted to say that there are increasing exports of British Kettle crisps to Russia and in spite all the difficulties I believe 300 Bentleys were sold this year in Russia - not I believe necessarily to employees of the foreign ministry - but nonetheless, a sign of progress."